The <environmentVariables> element of the FastCGI <application> element specifies a list of environment variables that Internet Information Services (IIS) 7 will pass to a FastCGI process when it is launched. The <environmentVariables> element contains a collection of <environmentVariable> elements that define the individual name/value pairs for each environment variable. Each FastCGI application that is installed on IIS 7 may allow or require environment variables to configure how the FastCGI application works. 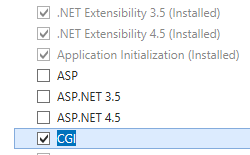 For example, one FastCGI application may require an environment variable that specifies where the application's configuration file is located, whereas another FastCGI application may require an environment variable that specifies the number of requests after which it will need to be recycled. 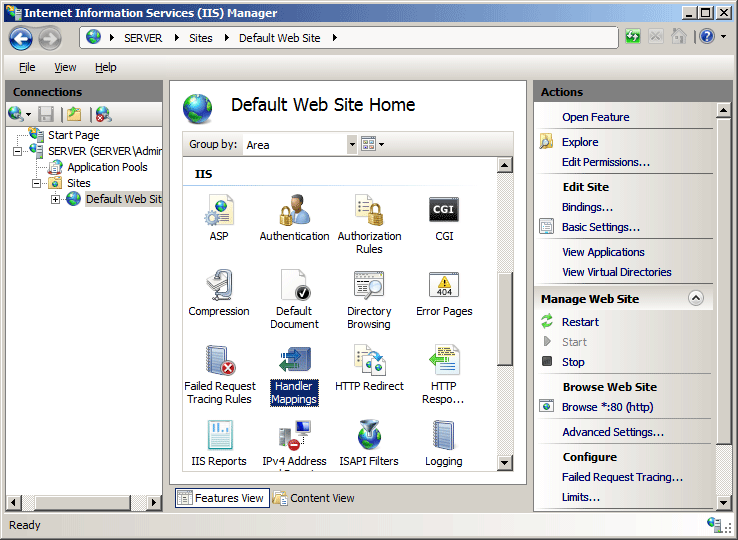 IIS 10.0 The <environmentVariables> element was not modified in IIS 10.0. 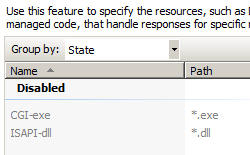 IIS 8.5 The <environmentVariables> element was not modified in IIS 8.5. 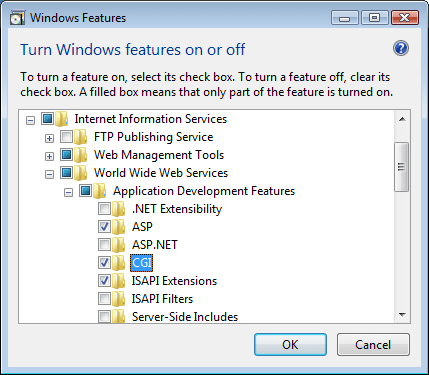 IIS 8.0 The <environmentVariables> element was not modified in IIS 8.0. 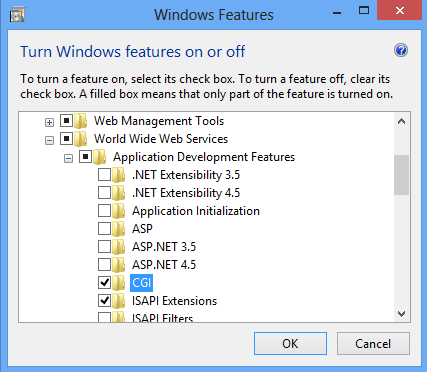 IIS 7.5 The <environmentVariables> element was not modified in IIS 7.5. 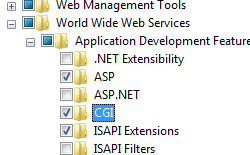 IIS 7.0 The <environmentVariables> element of the FastCGI <application> element was introduced in IIS 7.0. 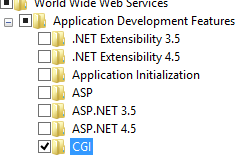 To use the FastCGI environment, you must first install the CGI role service. 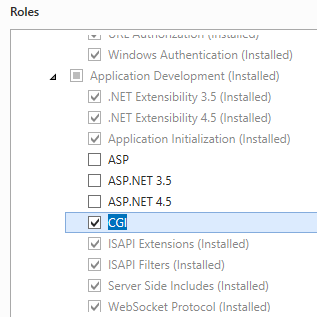 The installation process registers the Common Gateway Interface (CGI) role service in both the <globalModules> and <modules> elements. 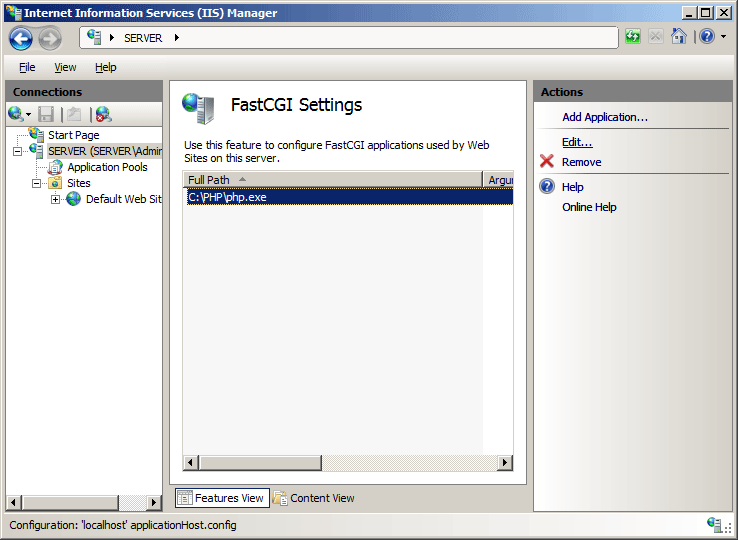 You do not need to perform any other steps to install the FastCGI environment. 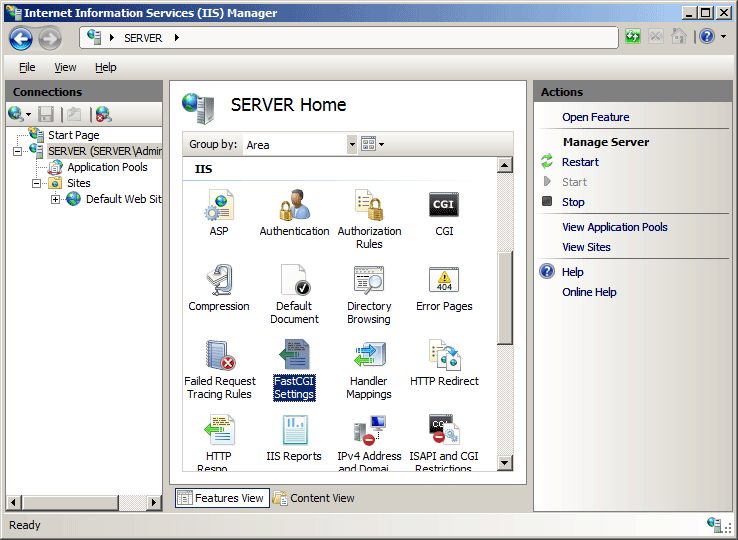 On the Server Roles page, expand Web Server (IIS), expand Web Server, expand Application Development, and then select CGI. Click Next. Expand Internet Information Services, expand World Wide Web Services, expand Application Development Features, and then select CGI. 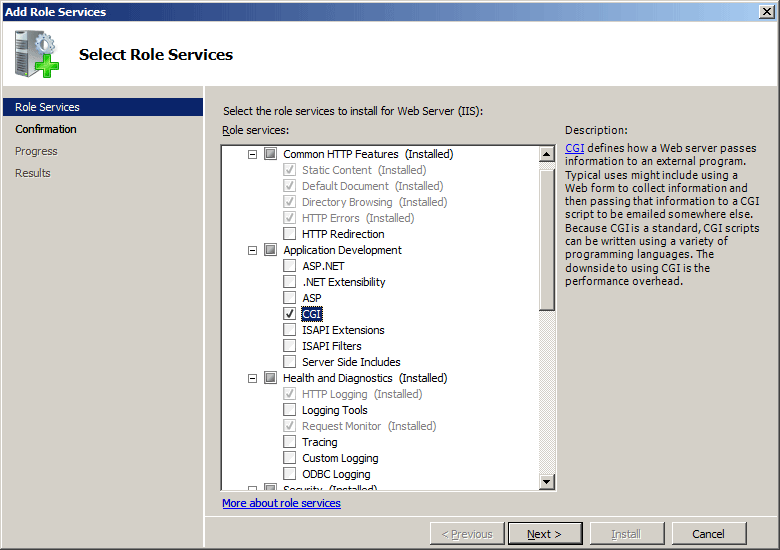 On the Select Role Services page of the Add Role Services Wizard, select CGI, and then click Next. Expand Internet Information Services, then select CGI, and then click OK.
Before the following procedure will work, you must have already installed binaries that will execute the file path or file name extension that you specify. This example uses a PHP implementation available from www.php.net. 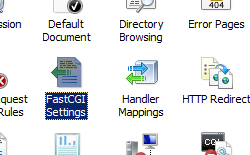 In the Connections pane, click the server name for which you want to configure FastCGI handler mappings. 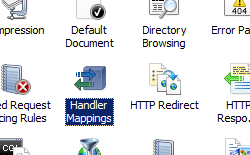 In the Home pane, double-click Handler Mappings. 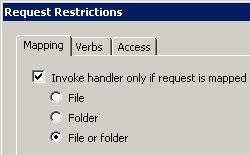 Enter the file name extension in the Request path text box. For example, "*.php". 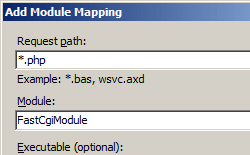 Click FastCgiModule in the Module drop-down list. Enter the path to the scripting engine in the Executable box. For example, "C:\PHP\php-cgi.exe". 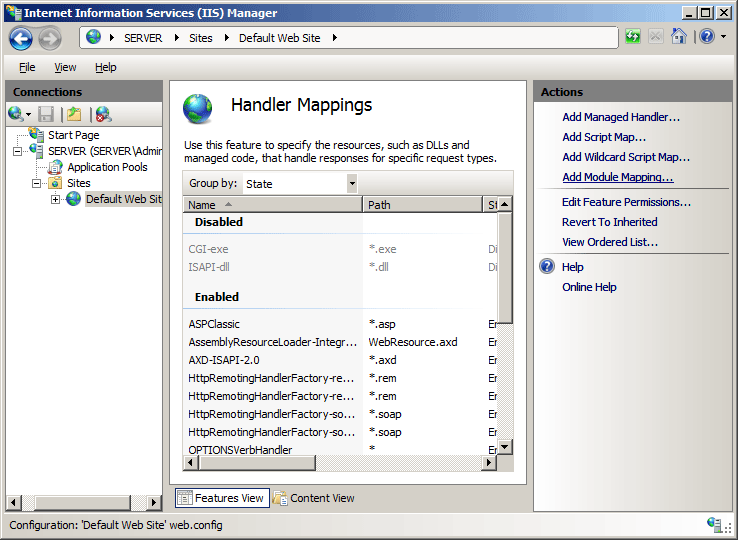 Enter a unique name for the handler mapping in the Name box. For example, "PHP-FastCGI". 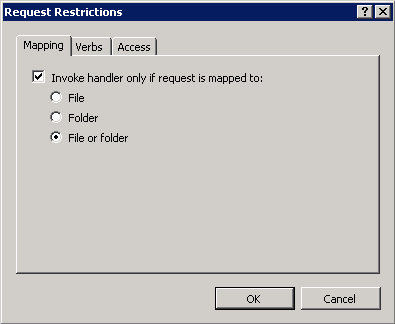 Select Invoke handler only if request is mapped to. Click to select the File or Folder option. 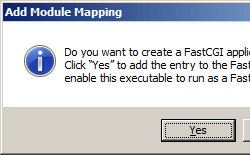 If you are prompted to create a FastCGI application in the Add Module Mapping dialog box, click Yes. > [!NOTE] > This will automatically create a FastCGI application for the handler mapping that you just created. 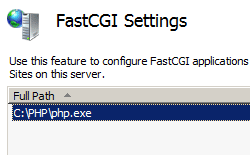 If you choose No , you can manually create a FastCGI application later. 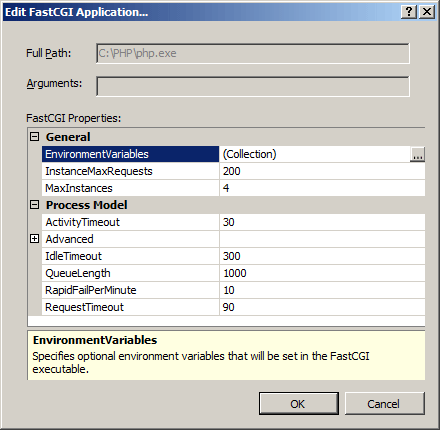 Adding a FastCGI application does not automatically add a handler mapping. 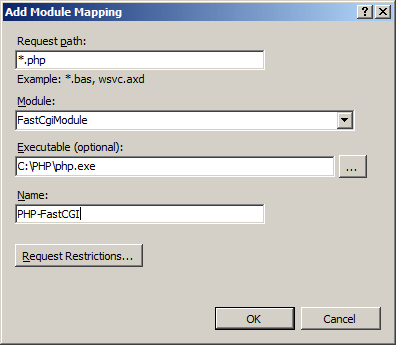 To do so, you would need to follow the steps in the How to create a FastCGI handler mapping for PHP section of this topic. 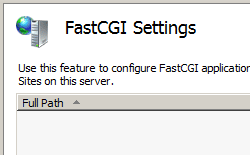 In the Connections pane, click the server name for which you want to configure FastCGI settings. In the Home pane, double-click FastCGI Settings. Enter the path to the scripting engine in the Full Path box. For example, "C:\PHP\php-cgi.exe". 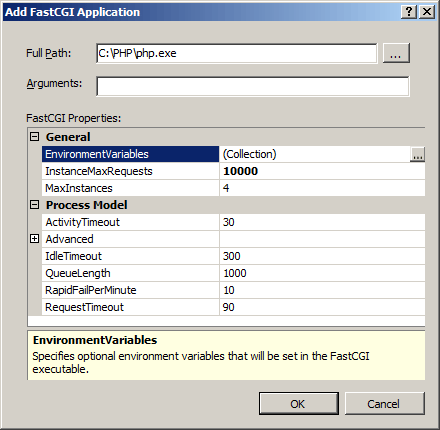 Enter the maximum number of requests for the FastCGI application. For PHP, this number must be lesser or equal to the maximum number of requests for PHP environment, which is configured by using the PHP_FCGI_MAX_REQUESTS environment variable. 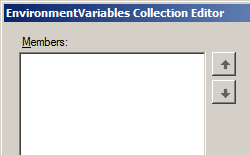 Click the ellipsis (...) next to EnvironmentVariables to open the environment variables collection editor. 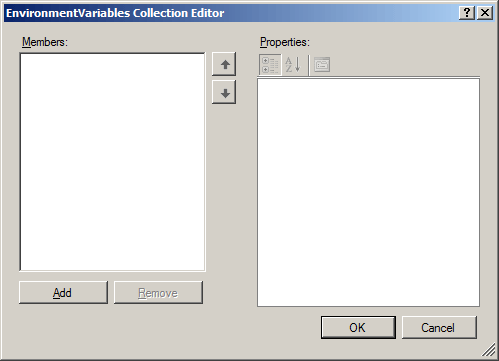 In the EnvironmentVariables Collection Editor dialog box, click Add. Enter the following information, and then click OK. 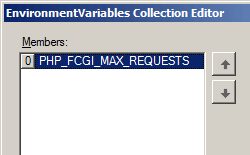 Enter "PHP_FCGI_MAX_REQUESTS" for the Name. Enter "10000" for the Value. 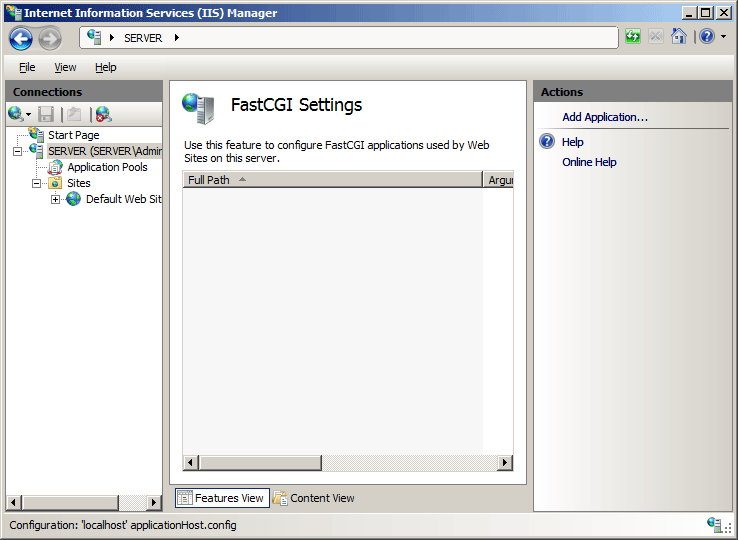 Click OK to close the Add FastCGI Application dialog box. 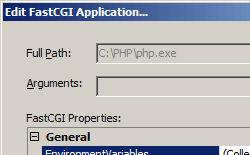 In the Edit FastCGI Application dialog box, click the ellipsis (...) next to EnvironmentVariables to open the environment variables collection editor. Adds an environment variable to the collection of environment variables. 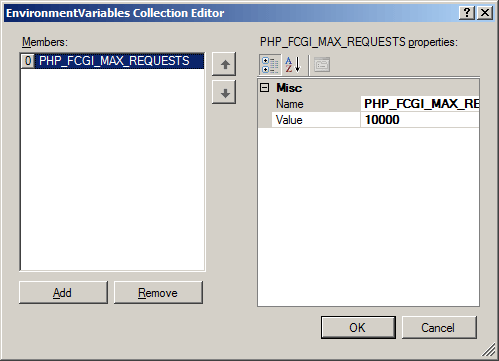 The following configuration sample adds a FastCGI application for PHP, sets the instanceMaxRequests attribute to "10000," and sets the PHP_FCGI_MAX_REQUESTS environment variable to "10000." For PHP, the value of the PHP_FCGI_MAX_REQUESTS environment variable must be a number that is lesser or equal to the value specified by the instanceMaxRequests attribute of the FastCGI <application> element. 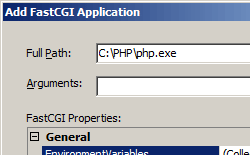 The following configuration sample adds a global FastCGI handler mapping for PHP files to IIS and specifies the full path to a FastCGI executable file. <add name="PHP via FastCGI 1"
<add name="PHP via FastCGI 2"
The following code samples add a FastCGI application for PHP, set the instanceMaxRequests attribute to "10000," and set the PHP_FCGI_MAX_REQUESTS environment variable to "10000." 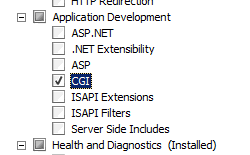 Each sample also adds a global FastCGI handler mapping for PHP files to IIS and specifies the full path to a FastCGI executable file.